Oh what fun! This bird is beginning to take form. 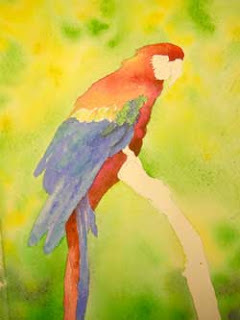 Using French Ultramarine Blue, Cerulean Blue and a touch of Sap Green, the same technique is used to paint the green and blue areas of the bird's body. Use a light touch!!! Your colors should always remain transparent. I used a little bit of diluted Indigo to develop some soft shadows here and there to indicate changes in feathers. Reserve most of this for later! A little goes a long way here and it is very easy to over work the painting or add too much pigment at this stage. Let gravity, water and paper tilting do some of the work for you. Never press enough on your brush that your bristles bend. Your brush is used here only to drop paint and push puddles of pigment around. If you over-work with your brush your painting will look dry and fussy, instead of looking fresh and spontaneous. If you are interested in learning some of these techniques, I have a booklet about painting trees on sale at my etsy shop. I am working on more booklets, so stay tuned to see what I am working on next! To order the Painting Trees Booklet click here. You will be taken to my etsy shop where you will find the booklets for sale. More to come on the bird soon!